This is an excellent effort by the author in translating the cookbook entitled Kanz al-fawāʾid fī tanwīʿ al-mawāʾid. The author of the original 14th century Egyptian manuscript is unknown. It consists of 830 recipes for a variety of different dishes and beverages. Thanks to the author Nawal Nasrallah, it has been translated for the first time in English and is available on different platforms for purchase. The book contains an introduction, a glossary and descriptive recipes with some modern adaptations of some classical dishes. Figures 2a-b. 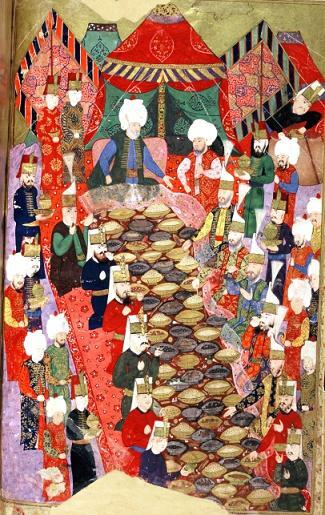 A banquet given by the commander-in-chief Lala Mustafa Pahsa to the janissaries in Izmit, 5 April 1578 (Source). 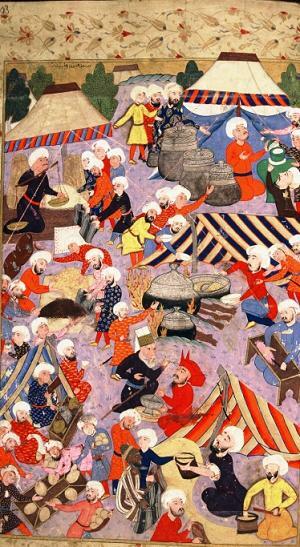 An Ottoman Bazar scene (Source). Nawal Nasrallah, a native of Iraq, holds a Masters of Arts in English and Comparative Literature and taught English and American Literature at Baghdad and Mosul universities from 1977 through 1990. She gave a number of lectures, presentations, and demonstrations on the ancient Mesopotamian and medieval Baghdadi cuisine, as well as modern Iraqi cooking in Bloomington, Indiana, and Boston, Massachusetts. Nasrallah produced a television program entitled "Baking with the Ancient Mesopotamians and Much More" on the ancient Sumerian flat tannur bread that is still being cooked to this day. She won second-place prize for "Milk on the Menu" cooking contest arranged by Gourmet Magazine, February 1997, and won first prize of the 1998 annual Holiday Cookie Bake-off in Bloomington, Indiana, and nationally under the aegis of Gourmet Magazine. 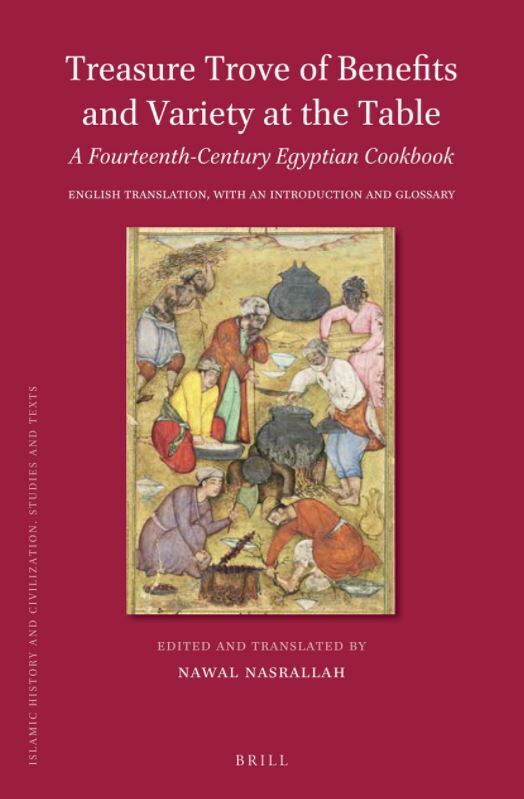 Nawal Nasrallah (translator), Annals of the Caliphs' Kitchens: Ibn Sayyar al-Warraq's Tenth-century Baghdadi Cookbook, Brill, 2007. Partially online in Google Books here. Kaj Öhrnberg and Sahban Mroueh, eds., Kitab al-tabikh, Studia orientalia 60, Finnish Oriental Society, 1987. See the Pages From Kitab al-Tabikh by Ibn Sayyar al-Warraq, edited by Kaj Öhrnberg and Sahban Mroueh (published by the Finnish Oriental Society as Studia Orientalia 60). Charles Perry (illustrated by Linda Sawaya), "Cooking with the Caliphs", Saudi Aramco World, vol. 57:4 (July/August 2006), pp. 14-23: read the full text online. 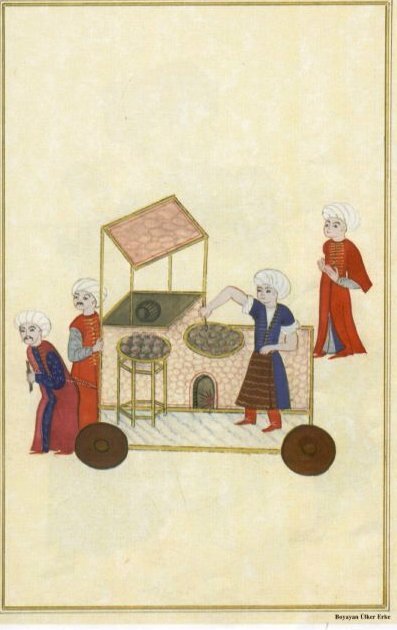 Charles Perry, A Baghdad Cookery Book (Petits Propos Culinaires), Prospect Books, 2006. A.J. 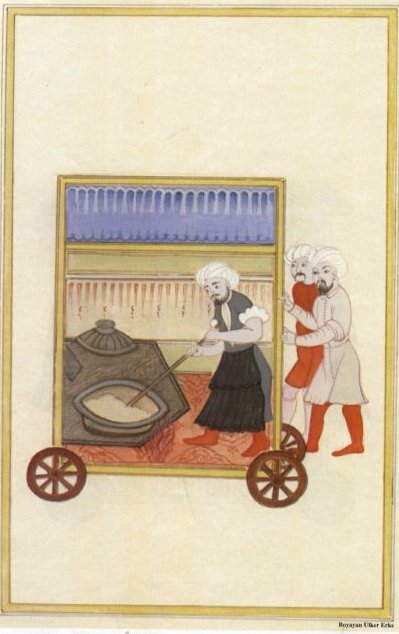 Arberry, "A Baghdad cookery-book", Islamic Culture, vol. 13 (1939), pp. 21–47 and 189-214. A translation of Kitab al-?abik? by Mu?ammad bin al-?asan bin Mu?ammad bin al-Karim al-Baghdadi, usually called al-Baghdadi (d. 1239 CE). Middle Eastern & Islamic Cuisine: The Tradition Continues… An Exhibition at Yale University's Sterling Memorial Library (February 1-April 19, 2007).